Symptoms: pasty skin, buggy eyes, coffee breath, muscle atrophy, slack jaw, prolonged staring out of windows. Diagnosis: office-itis. A couple of weekends ago, I was suffering from an advanced case of office-itis. I couldn't remember the last time I had been outdoors, breathing air... not counting, of course, the 30 second walk from apartment to car, and then car to office. 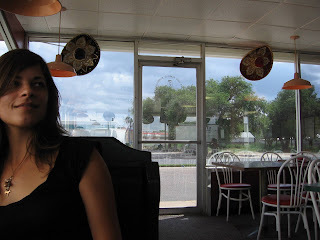 I was answering my cell phone "Thank you for calling Market Wire, this is Rebec -- DOH!" So I dug my hiking shoes out of the back of my closet and headed for the Malibu Creek State Park. I picked an amazing day to go -- not a cloud in the sky, warm, with a slight breeze. I'd never been there before, and I couldn't get over the fact that just a few miles from the smog and traffic and concrete of L.A. there was all this nature. Just sitting there! Every few minutes I would stop and go, "WOW. Wow. This is so beautiful!" After a relaxing afternoon filled with real, live oxygen, I headed back to the parking lot where I saw something that got me really excited. It was a sign for the ParkLINK shuttle. 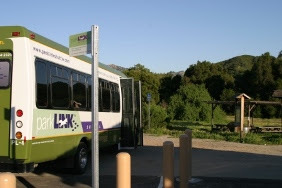 Apparently, the parks department offers a FREE shuttle to the Malibu Creek recreation areas, and it circles all around Malibu Canyon on weekends. There are park and ride lots, or you can catch it from a couple of different metro buses. This is fantastic because it means next time I'm itching for a hike, I can hop on a bus -- and no aggravating traffic or extraneous fossil fuel usage will bring me down from my natural high! Take THAT, office-itis! You re, I guess , probably very interested to know how one can manage to receive high yields . It gets down to choose a correct partner who uses your money in a right way - that is incorporate it in real business, and shares the profit with me.